Today we've pulled out the food markers and some homemade cookies to make Eyeball Cookie Pops. 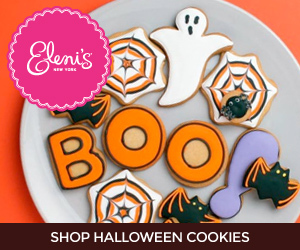 You can decorate these goods to give as treats at your Halloween party or leave the coloring up to the kids for a fun Halloween craft. All this week I'll be sharing super fun and quick Halloween Craft ideas and tutorials. I can't wait to share them all with you! Last Halloween I was coloring marshmallows. Over the summer I was learning how to use Royal Icing so I thought I'd experiment and see if food markers would work for the iced cookies… and yes! Yes, food markers are brilliantly fun to use with royal icing and cookies. You can use any marker colors you'd like for these eyeball cookie. I have two different sets of the Wilton food markers to get all the colors I use. You can decorate your cookies in no time, so this is a perfect fit for today's Craft Lightning project! Use the food markers to color the eyeball design on each cookie. Start with the lighter colors and then add in the black last… you can't color over black! I start with the bigger colored circle in the center of the cookie. Then add in a smaller black circle in the middle and outline the color with black. You can stop here or use the red marker to add in little drawn blood vessels for more of a spooky eyeball. After you make these eyeball cookie pops, take a look at my OREO eyeball treats and Halloween eyeball decor printables, you can host a whole eyeball party! I'm so excited to be sharing these extra quick craft ideas with you. This whole week I am co-hosting the Halloween Craft Lightning event with The Country Chic Cottage and 30 Minute Crafts (SO EXCITED!). Today I'm shaing some great Halloween DIY ideas from 8 creative minds. I hope you love them all! Welcome to today's Halloween Craft Lightning Roundup! Glow in the Dark Halloween Sign – AMAZING how cool a little paint and creativity can turn out! Super Cute and Simple Boo Card – such a cute idea – make a whole bunch to use as party invites! Monster Mouth Halloween Door Decor – I love door decor – amazing how easy this is! Candy Wrapper Headband – so clever – use your favorite wrappers to create your own design! Poseable Mummy – this little guy cracks me up – hide him around the house! Ugly Sweater Printable – color and design however you'd like. DIY Mason Jar Light-up Ghost – cute table decor project. Make your own Light Up Skull – paint it and light it up! So get your eyeball cookie pops made and while you munch on your DIY treat, you can make another 3 projects with these super quick ideas! There are SO MANY great Halloween printables, crafts, and DIY projects – you don't have to spend a lot of time crafting to make AMAZING holiday decor and accents!